​The Way Things Are, curated by Karen Wilkin, and featuring works from The William Louis-Dreyfus Foundation. 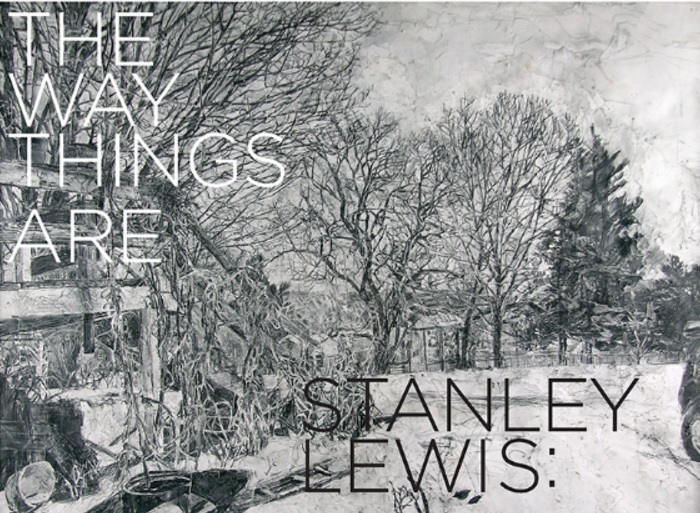 The exhibition will feature several of Lewis's large-scale graphite drawings, in additional to a number of ballpoint and pen-and-ink works, and a small selection of paintings. Lewis's work depicts mostly quotidian scenes of New England life; "glimpses of unremarkable interiors or whatever can be seen through the windows of his house or from its environs...a banister, things clustered on a kitchen table, a familiar tree, or parked cars," as Karen Wilkin writes in her introduction to the exhibition. She continues: "Lewis's drawings may appear, at first, to be records of perception, but they are far more ambitious than that. Seemingly unified images prove to be synthesized, near-panoramic views, translations of Lewis's experience of the three-dimensional world into marks on a flat surface, observations captured and reinvented. He turns his head to tease out the conversations among the random elements of our environment, reminding us that we navigate our surroundings by negotiating the distance between ourselves and everything around us. The fervor of Lewis's interrogation of his world finds an equivalent in agitated surfaces created partly by accumulations of strokes, partly by folding or cutting out, moving, and replacing sections of the paper - interventions that bear witness to scrupulous looking, thinking, and rethinking. The evidence of repeated attacks creates tension between seemingly truthful images and intensely physical "abstract" surfaces, offering testimony to Lewis's loving attention to both the demands of naturalism and formal imperatives. Even more important, the worked surfaces embody effort expended over long periods. Pay attention and Lewis's apparently straightforward views turn out to be complex distillations of the space we inhabit and the passage of time. Something similar obtains in Lewis's paintings. On canvas, as on paper, it's difficult to reconcile his physically disjunctive surfaces with his coherent, seemingly unexceptional images. Our focus keeps moving, as if we were recapitulating his shifting gaze, from motif to support and back again, as he worked. Yet it's this struggle among specificity, abstract structure, and testimony to the artist's actions that compels and holds our attention. We remain transfixed before Lewis's works, sandbagged by their strange ordinariness". Stanley Lewis's work has been shown in exhibitions throughout the United States, and was the subject of a retrospective at the American University Museum in the Katzen Arts Center in Washington and the Visual Arts Center of New Jersey. His paintings were featured in See it Loud: Seven Post-War American Painters at the National Academy Museum in 2014 and his work is included in the collections of the Albrecht Gallery in Missouri and the University of Indiana, among others. He has taught at The American University, Smith College, Parsons School of Design, the Chautauqua Institution and The New York Studio School. Awards include the Altman Prize from the National Academy of Design and a Guggenheim Fellowship. The exhibition will be accompanied by a catalog with contributions by Karen Wilkin, Martica Sawin, Eleanor Ray, Alison Hall and William Louis-Dreyfus. Stanley Lewis will be presenting Ideas about Donatello from a Painter's Standpointas part of the Studio School's Evening Lecture Series on October 18th at 6:30 pm. Admission is free, seating is available on a first-come, first-serve basis.